Guys, I almost cried when I found out that I've visited another Goblin K-drama shooting location. They didn't shoot in the temple but they shot at the trails outside the temple known as Fir Forest trails. Picture below is the entrance of the trail that Goblin K-drama was shot. Omgosh why didn't I do my research properly before my trip, I could have took a better picture that look much like the one in the drama. 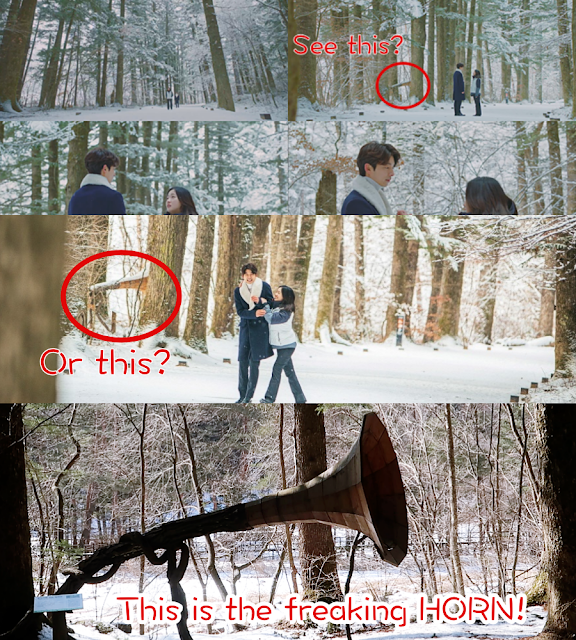 I saw the horn personally but I didn't really car much for it at that moment because the Fir Forest itself is truly wonderful. It was about 15-20 minutes walk to the temple from the entrance I've shown earlier and I kid you not, the walk was magnificent. 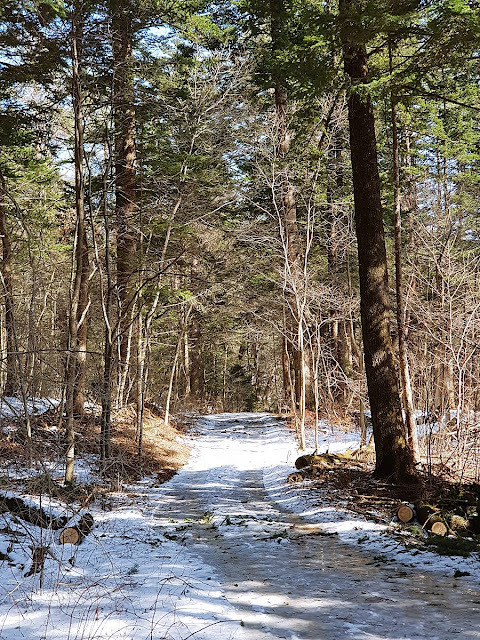 The Fir Forest trail was so peaceful yet so gorgeous at the same time, I couldn't help but to really take my own sweet time strolling along the rather muddy path (thanks to melting snow). 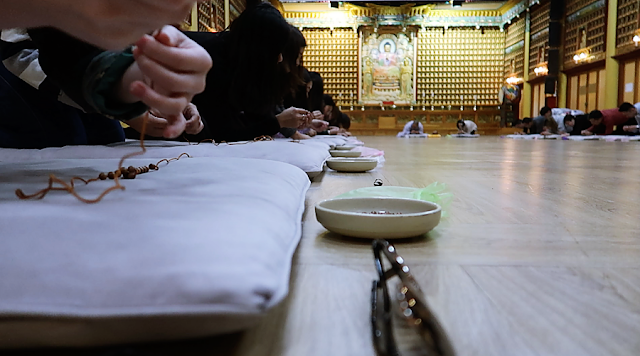 We didn't had much time, as usual, we had an appointment at the temple to experience making prayer beads. But I didn't care, most of us didn't too as there's just something about the Fir Forest that you'll like to enjoy and experience the most out the walk. As you walk through the forest, you'll be welcomed by a few sculptures here and there, making the place filled character. As you walk along the path, you'll soon come to a river (as picture above) that will make you want to stop and just listen to the water stream through the rocks. And the view, my goodness, breathtaking. 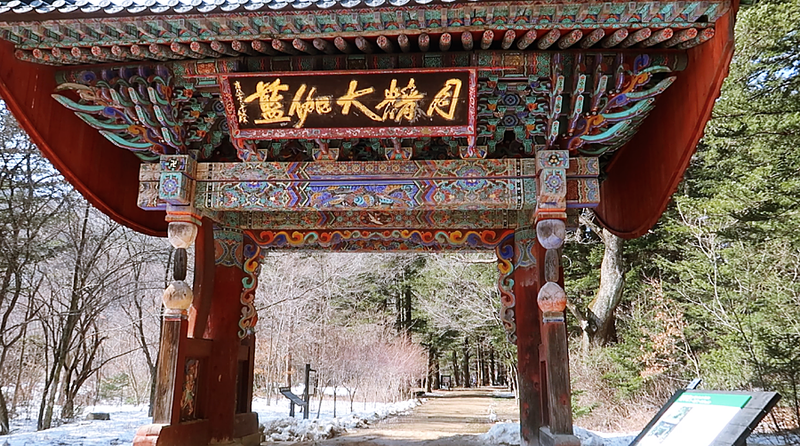 Check this video out for more of Woljeongsa Temple, Fir Forest and Prayer Bead Making! Once we reach the temple, we had our prayer bead making experience where we had to kneel 108 times, one for each bead, to complete them. I kid you not, after the whole thing, my body started aching but definitely was an interesting experience. Only after that, I was able to check out the temple with the limited time given. The main beauty of the temple is the Octagonal Nine Story Stone Pagoda (picture as below) standing tall in the middle of the place. This pagoda is one out of four National Treasures (placed at no. 48) in Woljeongsa Temple. Woljeongsa Temple is one of the must visit places when in PyeongChang, Gangwon Province, as it reflects so much culture for foreigners to experience. 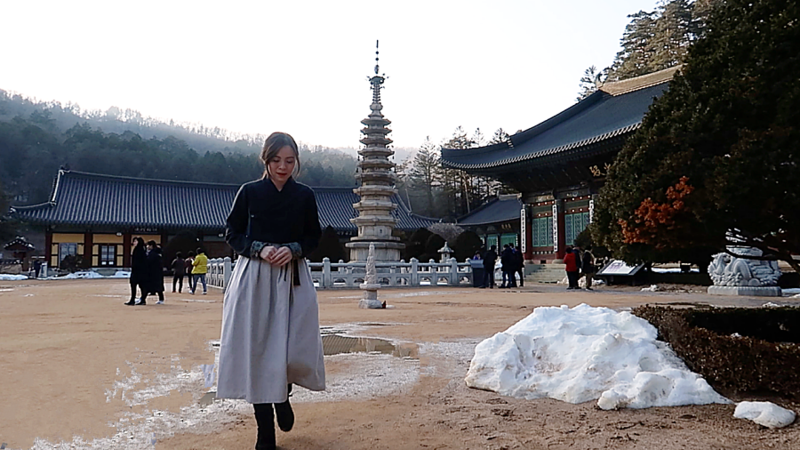 In fact, Woljeongsa Temple is also one of the many temples around South Korea that provides the Temple Stay Programme where you'll get to experience the Buddhist monk culture in Korea. Btw, I purposely dressed up in my winter modern Hanbok just so I can take a nice photo in a Korean temple. 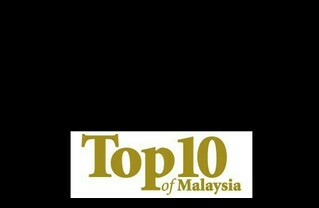 Lols. It seemed appropriate. I believe there's an admission fee. More info here.